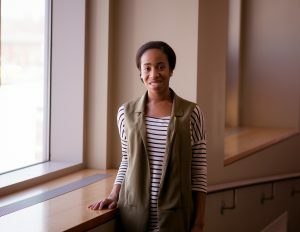 Posted March 27, 2013, in Featured Student. I am currently a Master’s degree student and teaching assistant working with Dr. Daniel Shain. To answer fundamental questions, we use annelids (i.e., segmented worms) as the model organism. Annelids are a wonderful model to study and have provided me with an avenue to address my interest in biological structure. Most annelids secrete either cocoons or brooding tubes in response to environmental demands and evolutionary success. These structures remain impervious upon exposure to many denaturing agents such as heat, pressure and chemical agents. My work as a graduate student thus far attempts to understand the structural features associated with annelid cocoons. As part of their normal reproductive strategy, clitellate annelids (i.e., leeches and earthworms) secrete cocoon material, deposit eggs, and seal both ends with glue-like plugs termed opercula. The structural composition of the cocoon wall has been previously documented and was shown to exhibit properties that can be directly related to physiology. For juveniles to exit the protection of the cocoon, opercula must detach. Although the timely breakdown of the opercula/cocoon wall boundary is poorly understood, the function of opercula as a plug/sealant has been documented. 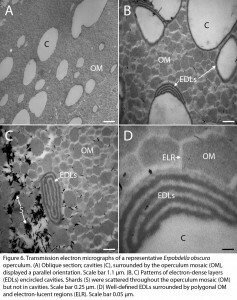 In a recent submission for publication, I describe the ultrastructure of opercula using transmission and scanning electron microscopy. In transmission micrographs, the dominating feature is described as a mosaic-like arrangement of electron-dense polygons (50-300 nm) that surround abundant ovular cavities. 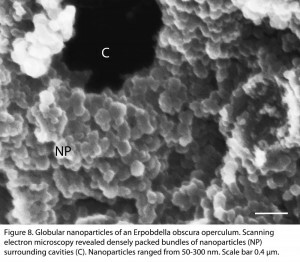 Scanning micrographs reveal a foam-like structure and the mosaic to be stacked, globular nanoparticles. Interestingly, these ultrastructural features appear to be related to other bioadhesives described in distant animal phyla (e.g., sea star, barnacle, mussel), suggesting a convergent mechanism of bioadhesion among animals. Future experiments are planned to describe the ultrastructure of brood tubes secreted by marine annelids (i.e., ancestral polychaetes), document and compare the cells responsible for cocoon/brood tube secretion, and determine the molecular aspects governing the composition of these proteinaceous structures. Page last updated by Department of Biology at 11:48 am April 30, 2013 . This page was printed from http://biology.camden.rutgers.edu/2013/03/27/anthony-rossi/ at 6:17 AM Sunday, April 21, 2019.